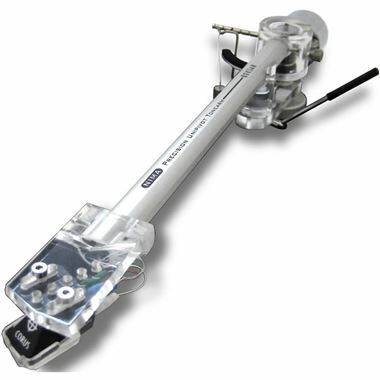 Roksan Nima Unipivot Tonearm. Available with Online Finance and Free Delivery. Combining solid aluminium alloy tubing, stainless steel alloy and polished acrylic this remarkable arm is made of no less than ten individual precision machined components meticulously hand assembled. NIMA does not have standard internal wiring, therefore to transmit the signal from the cartridge the same flat printed circuit board cable developed for our top of the range Artemiz arm is employed. The unique design of the transit locking mechanism of the bearing assembly not only provides a safe transportation method but also avoids damage if the arm is accidentally lifted off its bearing. Vertical Tracking Angle (VTA) adjustment provides optimum alignment for almost any cartridge. The combination of polished acrylic headshell, silver anodised aluminium tubing and mirror chromed counterweight enhances NIMA's looks and conveys the true lightness and neutrality of this very special arm.